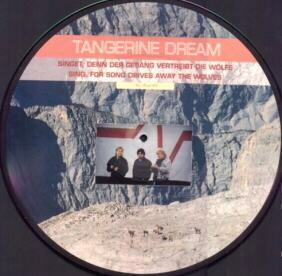 Back in the UK after four years, Tangerine Dream's 1990 tour was a mixed success. They faced packed as well as only quarterly filled venues. One of the hotter shows was held at Bristol, and an excellent recording came out in 1991 as Bicycle Race with a nice, printed cover based on the cover artwork of Melrose. The album title itself was obviously inspired both from the album photo as well from the 1988 album title Optical Race. 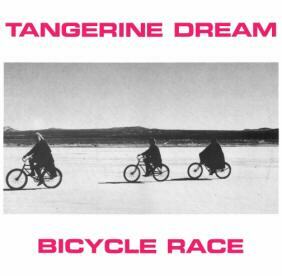 In 1992 copies of Bicyle Race appeared on black vinyl. The cover was identical, but the records did not contain any TD music but heavy metal music. No information was given on the labels. It is unknown whether this was only a mistake or some bootleggers' very special way of making money. In late 1993 the bootleg album was reissued under the strange name Singet denn der Gesang vertreibt die Wölfe / Sing For Song Drives Away The Wolves. The matrix numbers are identical. The A side of the picture-LP shows a rocky landscape and, in the center, a photograph of Paul Haslinger, Chris Franke and Edgar Froese (who are the wrong line-up for this period). On the B side there is a photograph of a canyon landscape at dawn, a photo of Edgar Froese and the track listing. On Bicycle Race the compositions were titled Sequence I through VI, now they got new German fantasy titles. The text wrongly mentions that the concert took place in Bristol/USA. The number of copies circulating is unknown. Some more of the Bristol concert was released on the bootleg CD In den Gärten Pharaos / Bicycle Race. This bootleg became obsolete due to the release of Tangerine Tree Volume 70: Bristol 1990.